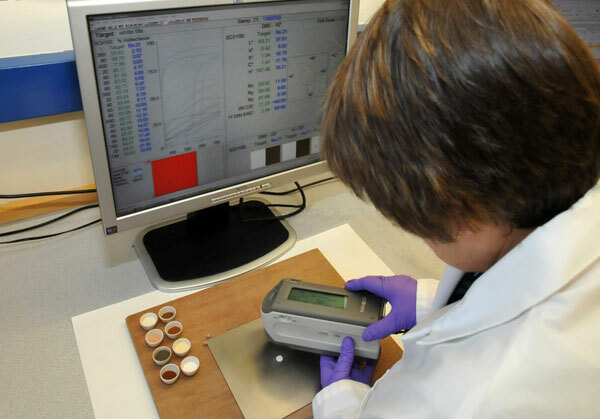 Spectral colour of powdered samples can be measured using a Konica Minolta spectrophotometer available in the Forensic Section of the James Hutton Institute. It can also be used to measure the colour of any flat surface. We currently measure finely ground minerals and soils on a regular basis for the criminal justice system, the minerals industry and the oil and gas sector, but the instrument can be used to measure any type of fine powder. Spectral colour is measured in the region between 360 and 740 nanometers. L*a*b* colour space (CIELAB) measurements are also recorded and other measurements such as Whiteness (WI CIE) or Yellowness (YI DIN 6167) can also be taken if required. This technique is accredited by ISO17025 and the work is covered by the ISO9001 accreditation.